Deep dives on cities, architecture, design, real estate, and urban planning. I don’t recall the particulars of that day a few weeks ago—not the weather or what I was wearing or where I was headed—but I remember that white, mid-2000s BMW 3 Series and the twisted face of the middle-aged man behind the wheel. And I remember pulling my bike off to the side of the road and thinking, Did he just try to kill me? In Atlanta, the streets are peppered with hazards for cyclists and pedestrians, and even cars. Our roads have crater-like potholes and deep cracks and mangled sidewalks. We have mammoth metal plates that city workers slap down over roadway imperfections that, in some cases, would probably be better left alone. And then, we have drivers. In Atlanta, the car is king, and we pedestrians and cyclists, by and large, are expected to yield to motorists. Decades of nearsighted city planning and design have left non-drivers to fend for ourselves and keep a constant, optimistic eye out for the rare bike lane or wide, flat sidewalk. As that BMW driver buried his hand in the horn, trailing me south down Boulevard, Oakland Cemetery at our west, I could tell he didn’t think this cyclist had a right to ride in his lane. I was cruising downhill, and I couldn’t have been traveling much less than the speed limit. Yet something about my presence gripped the driver with rage. He lay on the horn as he overtook me on the left. He shouted an obscenity through his sunroof, and I countered with my own. Then, maybe 100 yards ahead, the Cabbagetown traffic light went from green to yellow, and then to red—the perfect opportunity for me to get a few cars’ distance ahead of him. But as I hugged the curb to my right, ready to put this hostile person in my proverbial rearview, he yanked his steering wheel that same direction. I reacted by trying to overtake him on the left, and as I cut around his driver-side taillight, he swung his door open. I was merely inches away from being gored by the car door, but I dodged it and raced ahead a few cars and waited for the green light. My heart now racing, I exited Boulevard left at Reinhardt Street, where I stopped and collected myself. Breathing heavy, I made eye contact with the man, and we exchanged middle fingers as he continued south. Did he just try to kill me? My bicycle isn’t exactly cutting-edge. For better or worse, she’s a classic. Assembled in the mid-1970s, the Raleigh Super Course 12-speed, painted royal blue with chrome accents, was my father’s, and it still flaunts mostly original parts. My dad scored the bike when he was roughly my age, 25, for $150 at a garage sale in Los Angeles. I’ve been offered $400 for it as-is, and north of $1,000 restored with all the original, handmade parts. But it’s not for sale. Despite the fact that most of Atlanta has been mapped out to accommodate automobiles, and that my younger brother’s car sits at the ready in my Cabbagetown driveway nine months of the year, I prefer to experience the city from behind the handlebars or on foot. That makes me the exception. And that hasn’t always been easy. Or safe. Admittedly, I used to fancy myself something of a gearhead. But when I transferred to Georgia State University and moved downtown in 2014, I left my babied 2004 Jeep Wrangler in Johns Creek, where my younger siblings would use it. After all, I was having no trouble walking from my apartment, on the Beltline’s Eastside Trail, down Auburn Avenue to GSU’s main campus. In 2015, we traded in the Jeep to help finance a brand new Dodge Dart Rallye with a zippy, turbocharged Inline-4 engine. Over the course of a few months, I retaught myself to love driving. But still, I preferred walking, so the Dart found itself largely under the purview of my suburban family yet again—until it was totalled in 2016. Rather than use the insurance money to buy a new car, I decided I’d be fine without one. About three years later, I like to think I have more hard-earned wisdom than regrets. And a few horror stories. Maybe it sounds obvious, but the Atlanta Beltline is far-and-away the best (or safest?) place to cycle in the city. Living in Cabbagetown—after being priced out of my $1,500 three-bedroom loft on the Eastside Trail—I often find myself using Edgewood Avenue to get downtown. I find few reasons to tangle with the treacherous DeKalb Avenue or the similarly dangerous Memorial Drive. Every cyclist has their favorite corridors for riding. One of mine, for instance, is downtown’s Peachtree Center Avenue, which features a two-way bike path running parallel to the northbound-only city street almost all the way to Midtown. Before the lights turn green for motorists on the popular roadway, cyclists and pedestrians are afforded a few-seconds head start by the traffic signals on the street corners, which is nice. Of course, we each have our nemesis streets as well. As with DeKalb Avenue and Memorial Drive, I won’t bring my bike to Buckhead. Ever. I’ve made that mistake before and ended up walking the bike. I’d rather catch an Uber from the local MARTA station to get where I’m going than toy with Lenox or Peachtree roads. Even Midtown is a bit of a coin toss on the cycling front, although, for the most part, the fast-evolving neighborhood is a delight to walk through, some busted or blocked sidewalks notwithstanding. Still, serious improvements are needed. Midtown’s Monroe Drive, near Piedmont Park—where a Grady High School freshman was killed crossing the street in 2016? I won’t touch it. Frankly, it’s not worth risking my life. Being limited to bike and foot travel, I’ve learned plenty about myself and my surroundings. Street-level insights, you might say. For example, in hotter months, I know that it takes me about 15 minutes to stop sweating after a strenuous ride, and maybe another 15 for my shirt to dry after that. To combat unsightly wetness, I tend to arrive to interviews and meetings about half an hour in advance. That also allows me time to run through my notes before I sit down with interviewees. Then again, an air-conditioned MARTA ride solves all of the above. I’ve also taken to carrying a garbage bag in my backpack, just in case I need to cover my computer when it starts raining. Also, I now remember to tuck a water bottle into the side pouch of my bag, after learning the hard way that even MARTA’s Buckhead headquarters, among other places, does not have a water fountain in the visitors lobby. And don’t get me started about biking near the streetcar tracks, which will easily gobble your wheels and throw you over the handlebars (I’ve only narrowly avoided such a fate). Or the streetcar drivers who’ll gladly lay on the horn as they inch behind you. 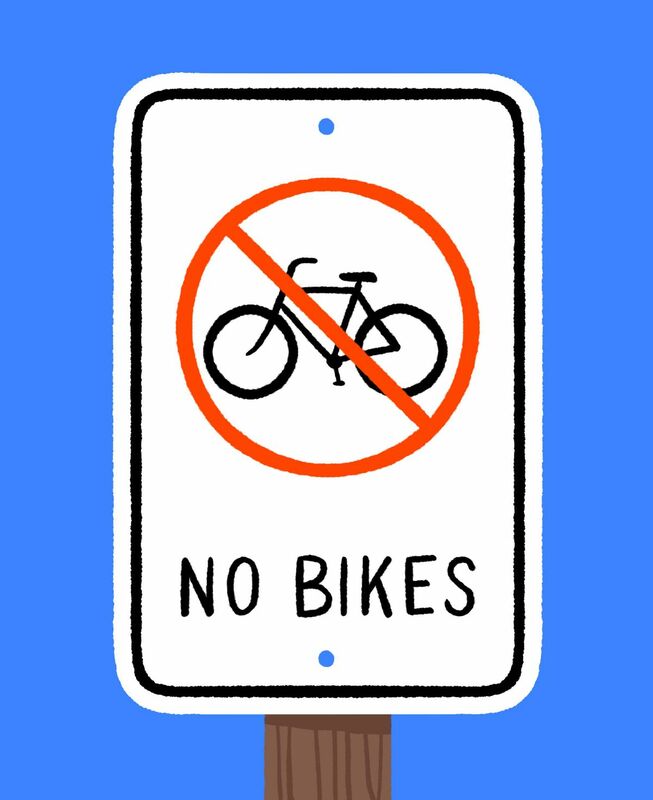 Admittedly, I don’t often abide by those “No Bikes Allowed” signs dotting parts of the streetcar route along Edgewood Avenue, because that route is too crucial for getting around. Owning a practically prehistoric bike—in constant need of new tubes and other minor ratcheting—means I’m not just a cyclist, but also a frequent pedestrian. Considering that’s how I experienced Atlanta when I first moved here, it’s no wonder that I’ve taken a strong liking to the slowest method of transportation. Traversing the city by car or bike, you’re sure to miss the elements of Atlanta that make Atlanta, well, Atlanta. On foot, the streets tell a story. Walking, it’s hard to ignore the city’s beautiful public artwork—legally created and not—or the remnants of long, weird nights. Sometimes that means blood or hair or bullet casings or chicken bones littering Auburn Avenue. Other times, it’s fast food wrappers surrounded by political propaganda favoring the hottest wannabe city councilmember or state senator or governor. It’s fun to imagine what might have transpired around such effects before they were recklessly discarded—something I couldn’t do if I was behind the wheel. Especially in this digital age, however, walking around Atlanta requires strict focus. Strolling phone-in-hand, I could trip over a sidewalk divot or discarded e-scooter. So far, the Atlanta City Council’s new e-scooter legislation hasn’t had an observable impact on the cluttered state of our urban walkways. And municipal efforts to repair or replace our sidewalks, though commendable, haven’t made them widely inviting to walkers or wheelchair users—some of whom have actually sued the city. Needless to say, burying your face in the screen is a fine way to break an ankle—or to end up on the hood of a car, in the middle of a crosswalk, as my friend John has found himself. Atlanta needs “complete streets,” and not just where city officials deemed them necessary when crafting the Renew Atlanta and TSPLOST infrastructure improvement programs that voters approved in 2015 and 2016. We need complete streets initiatives—upgrades to cyclist and pedestrian facilities, many times at the expense of automobile lanes—everywhere. That might sound far-fetched, a financial and bureaucratic pipe dream. But it’s not too much to request that local leaders actually follow through on promises of widespread transportation system upgrades that would benefit Atlanta at large. There are too many examples of city officials doing the opposite, such as when Renew Atlanta funds were rerouted to help develop the eye-roll-worthy, $27 million pedestrian bridge arched over downtown’s Northside Drive near Mercedes-Benz Stadium. As we speak, parts of Memorial Drive are being restriped to help curb congestion issues. None of those updates include bike lane installations, and the public rights of way apparently aren’t conducive to the creation of wider sidewalks. To make things like that happen, road diets—cutting out a car lane to create better bike and walker facilities—would be needed. But such changes would take a lot of harrumphing and lobbying. To make serious strides in becoming a true urbanist mecca, however, lawmakers in Atlanta and at the Georgia statehouse would need to entirely rethink how they view the future of transportation. Efforts to build new parking decks, especially downtown, need to die. Places like Gwinnett County, which just shot down the prospect of stringing a five-mile heavy rail line from the Doraville MARTA stop to near the intersection of Interstate 85 and Jimmy Carter Boulevard, should be conscious of the fact that a solid transit line won’t bring crime; it would bring easier accessibility to intown jobs and other Atlanta destinations. The same goes for transit-resistant suburbs like those in Cobb County or North Fulton, such as my hometown Johns Creek. Only when I need to get to Johns Creek to see my family do I even consider the necessity of a car. And even then, rideshare options have made that hassle virtually a non-issue. On more than one occasion, I’ve been chauffeured to the suburbs for less than $40—a welcome fee, relative to the constant gas purchases, car payments, and insurance costs that come with owning a personal motorized vehicle. Sure, Atlanta has miles to go, in terms of revising its roadways as more inviting places for people using alternate modes of transportation. But with close proximity to just about everything an Atlantan could ask for—bars, restaurants, offices, and the world’s busiest airport—I can’t imagine ever needing immediate access to my own steering wheel. Maybe one day that won’t sound so radical. Still, I’m cognizant of the fact that many people couldn’t pull this off. I’m fortunate to be young, single, and childless, as ferrying kids to soccer practice would probably be challenging. And it’s true that getting myself to work oftentimes entails little more than rolling out of bed and opening the laptop on my desk. But when traveling across my city is a must, there’s nothing like the wind in your face and bugs in your teeth and an aggravated streetcar driver at your rear to remind you that you’re part of something greater than a traffic jam. That you’re part of the solution.